We have a family of cardinals that live in a nearby tree. They like to drop by every day for the sunflower seeds we put out during the winter. He was looking for left over seeds from the Ferris Wheel Feeder that was tipped over and left draining after the previous day’s rain. You might have seen the Ferris Wheel Feeder video that I posted after the last snow storm. If you follow me on twitter, you might recognize the image on the right. 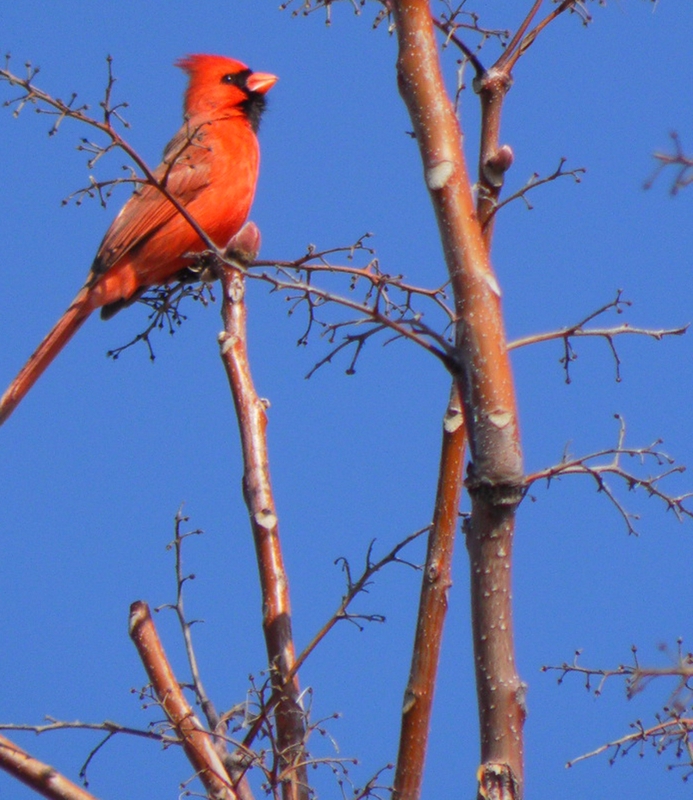 It’s the very first picture I took of the cardinals in my neighborhood. 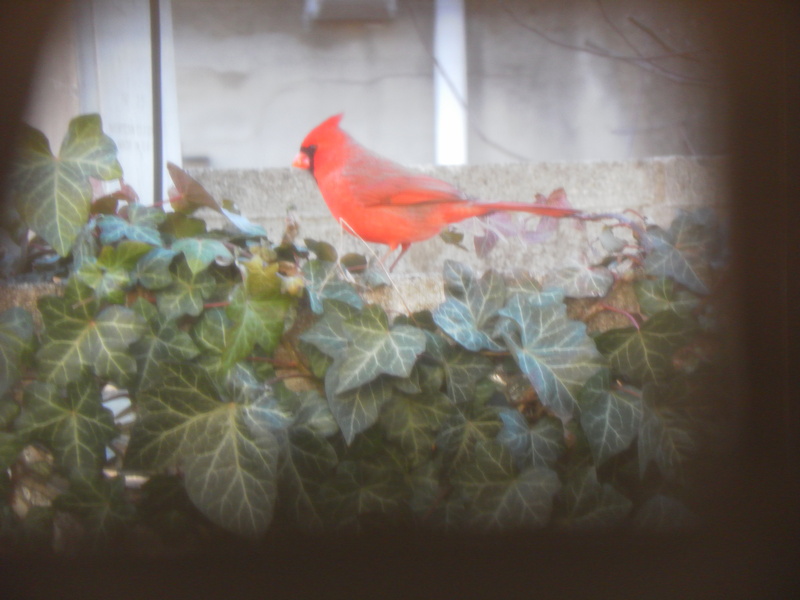 It was a huge surprise for me to discover we had cardinals in South Philly. Seriously, I’ve lived in (or around) Philadelphia all my life. I have never seen a cardinal in the city. This last picture is my favorite from Saturday. The border around the image was not added. 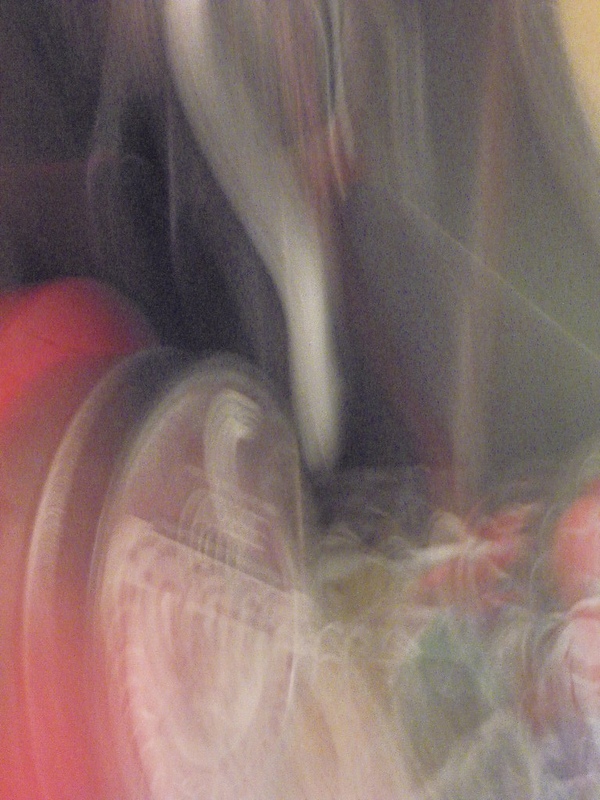 I was shooting the cardinal through some house plants. I also had the blinds down because I was trying not to scare the cardinal away. The final result is pretty cool. There are some superstitions surrounding birds that appear after the death of a loved one. Some believe that birds “sometimes appear as envoys from the spirit world — fleeting emissaries of loved ones who have passed on to the other side.” I like that idea. It would be nice to think that my friend Fran was just dropping by to say hello. 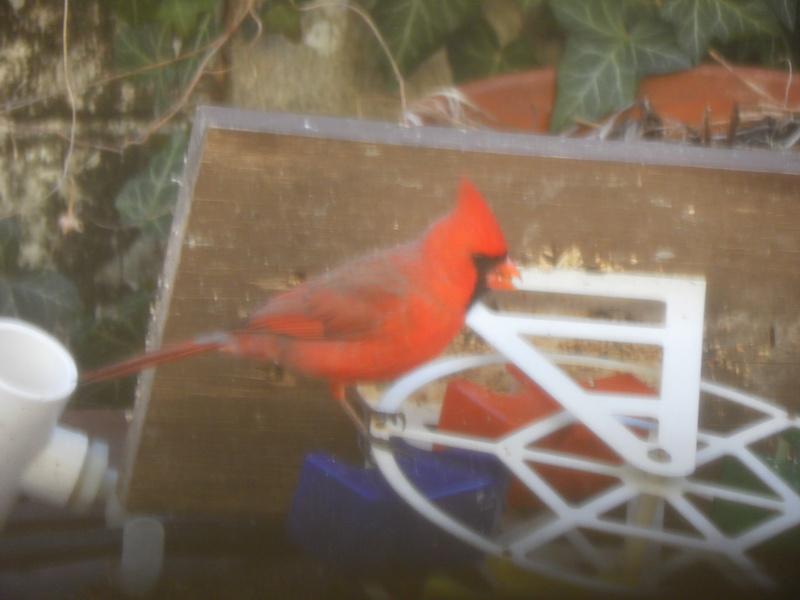 Most likely, it was just a member of a family of cardinals picking through the debris, looking for sunflower seeds to feed his family. Either way, it was nice to see him. As the adage goes, it’s the little things in life that sometimes make you the happiest. For me it’s true. I may not win the Powerball anytime soon, but as long as the cardinal comes to visit once in a while, I’ll be happy. 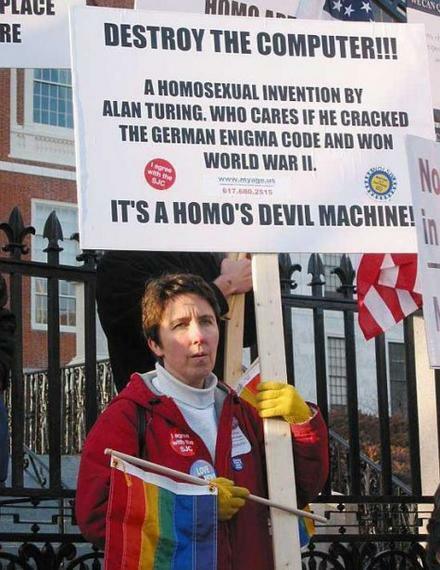 A Homosexual Invention By Alan Turing. Who cares if he cracked the German Enigma Code and won World War II. It’s A Homo’s Devil Machine! I saw this photo circulating around the interwebs. It bothered me that there was no information identifying it’s source. So I did a Google image search for the image to find out what, if any, protest this is associated with. The very first link took me to an online video game “Destroy The Computer” (by KibaGames) in which you throw punches at, you guessed it, a desktop computer. But it didn’t explain the anti-gay signage. It’s a stretch to assume punching the computer symbolizes a hate crime in some way. — Though I’ve certainly hated my computer at times, I don’t believe my PC represents ALL computers. That would be OS-ist. The earliest posting I could find of the image was May 2006 on Barking-Moonbat.com. A watermark on that image led me to StrangePolice.com and that’s where the trail ends. The fact that there is more than one person in the photo, and that they are closely grouped together, leads me to believe this is a staged photo. Why anyone would stage such a photo is anyone’s guess. Part of me suspects it’s a promotional stunt to raise LGBT awareness. Not many people know who Alan Turing is, or that the process by which he cracked the German Enigma code led to the modern day computer. 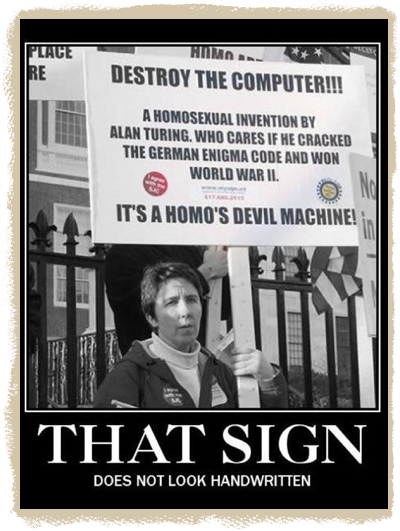 Many more are unaware that Turing was a homosexual. This simple image has been spreading LGBT awareness around the interwebs in it’s own little way for more than seven years. None of the feedback that I’ve seen has been particularly homophobic. That, in itself, is pretty amazing. 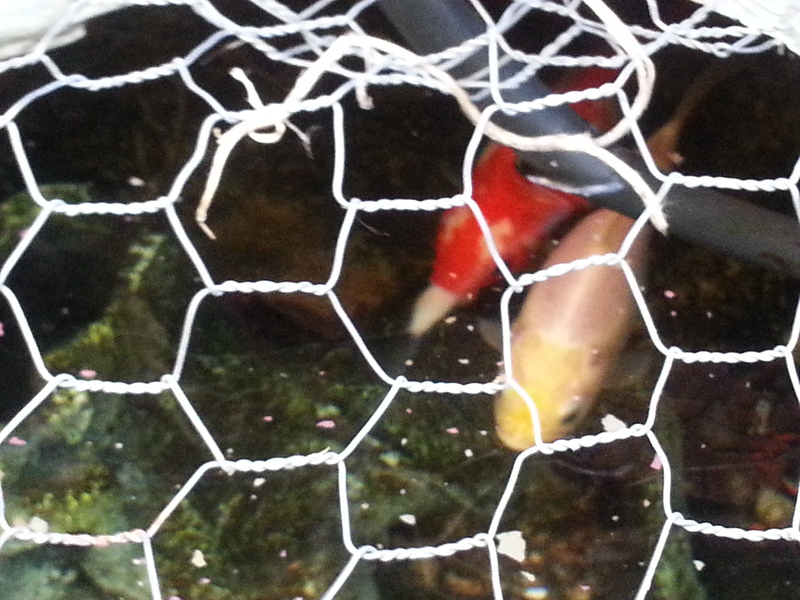 RIP Bertha and Creamsicle. …or was that Fish Two? is the passing of two 99¢ goldfish. 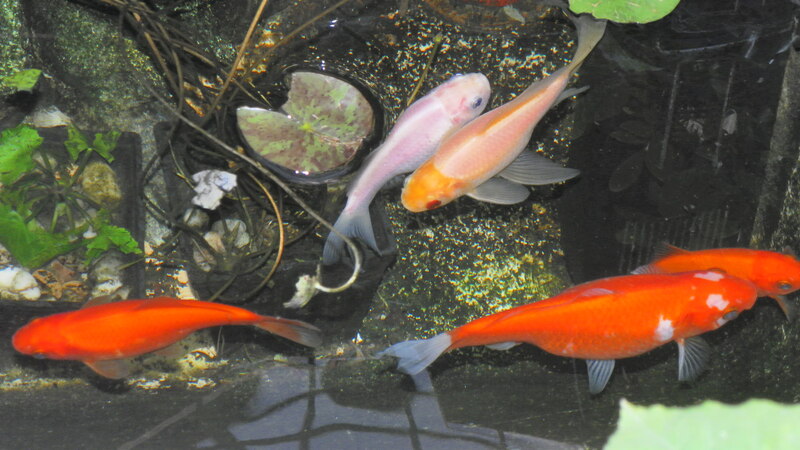 Bertha, Creamsicle, Ice, Fish One, and Fish Two. Bertha got his name because he eats everything. …and it shows. 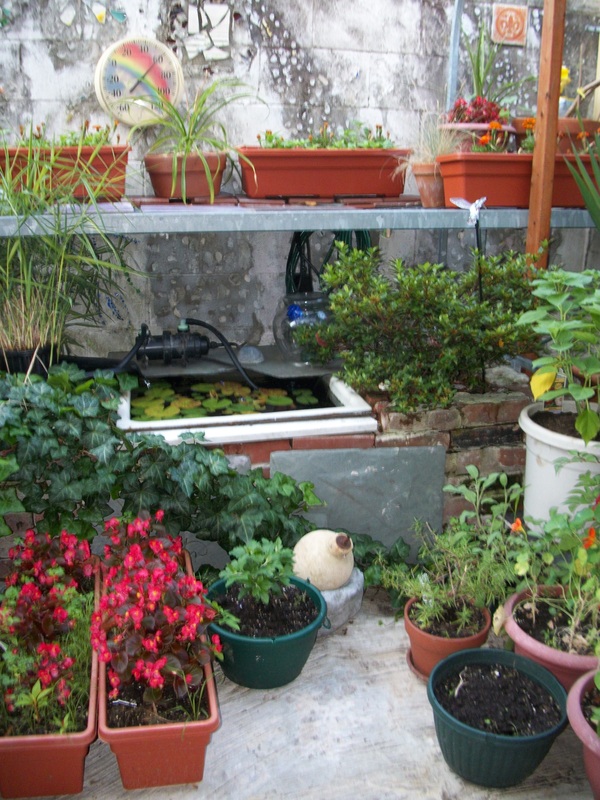 In the spring of 2009, we re-purposed an old cast iron utility sink as a small goldfish pond. 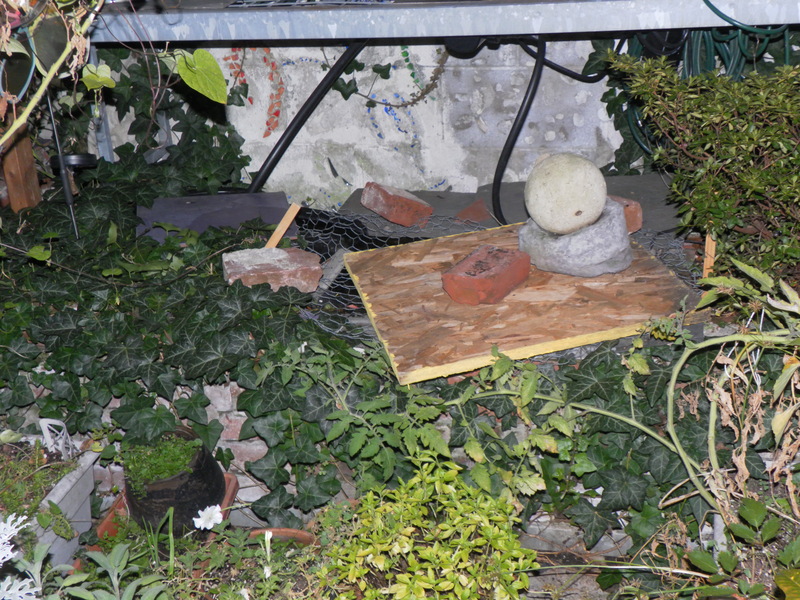 It would also serve as a makeshift water feature for the tiny 10 X 14 ft concrete space that we affectionately refer to as our “South Philly Backyard”. 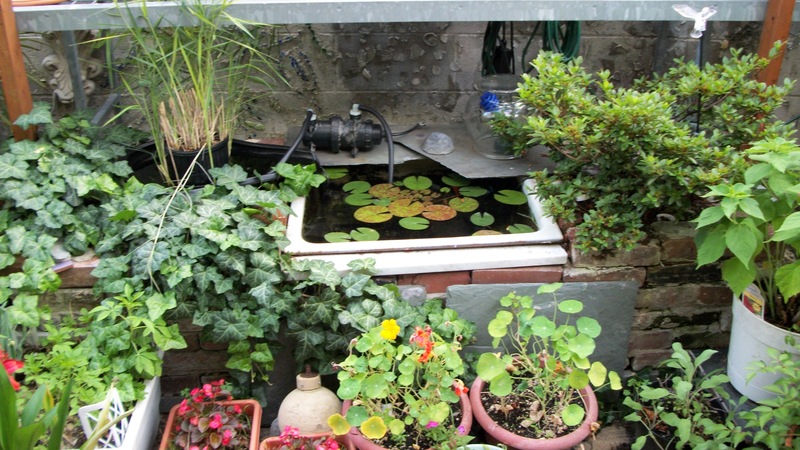 Salvaged bricks frame the cast iron sink, which served as home for a family of five goldfish. Bertha, Creamsicle, Ice, Fish One, and Fish Two. — Bertha got his name because he eats everything. …and it shows. We made good use of a discarded plant display rack from our local home center. The steel frame footing served as a guide for the bricks, which are loosely mortared together. (We rent, so nothing can be permanent.) The bricks support the sink and raised planting beds on either side. The magic word here is upcycling. We spent very little money on our “back yard”, but the results are truly amazing. Our small concrete lot is transformed into an oasis as winter turns into spring. A micro-ecosystem with plants, fish, insects, and the occasional bird. It’s interesting how the addition of our little pond created a micro-ecosystem. Even though a small pump kept the water moving, some insects still found places to breed. Those insects became food for our fish and the birds who used our little oasis as a rest stop. Mourning Doves and Cardinals were a big surprise to me. Next year we’re going to try to attract humming birds. A shoveled path from backdoor to pond. 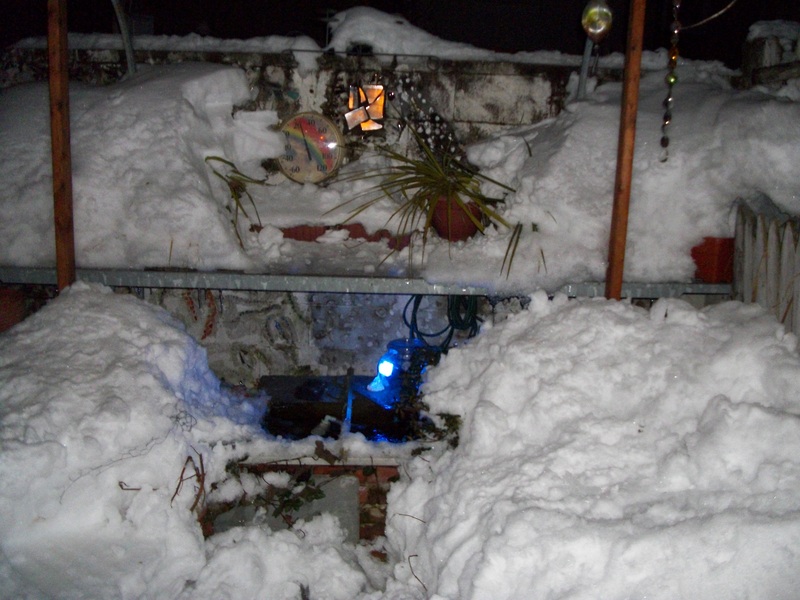 If you follow me on twitter, you might have read comical grumblings over the winter as I performed the necessary task of chipping away at the ice that formed on the top of the water. — Even frozen fish need air. Bertha (left) caught a slug! Several weeks ago, we discovered a raccoon trying to hunt the goldfish. A Raccoon? Really? In South Philly? After four years of heatwaves, blizzards, and chipping away at ice, we were not about to allow our goldfish to end up as a midnight snack for some wayward raccoon. No sirree Bob! Not on our watch. Makeshift pond cover deterred Mr Raccoon for a few weeks. The simplest idea was to steak chicken wire around the open water, and lay a weighted board over the pond at night. This, along with sprinkling a raccoon repellant around the perimeter of the yard seemed to work. 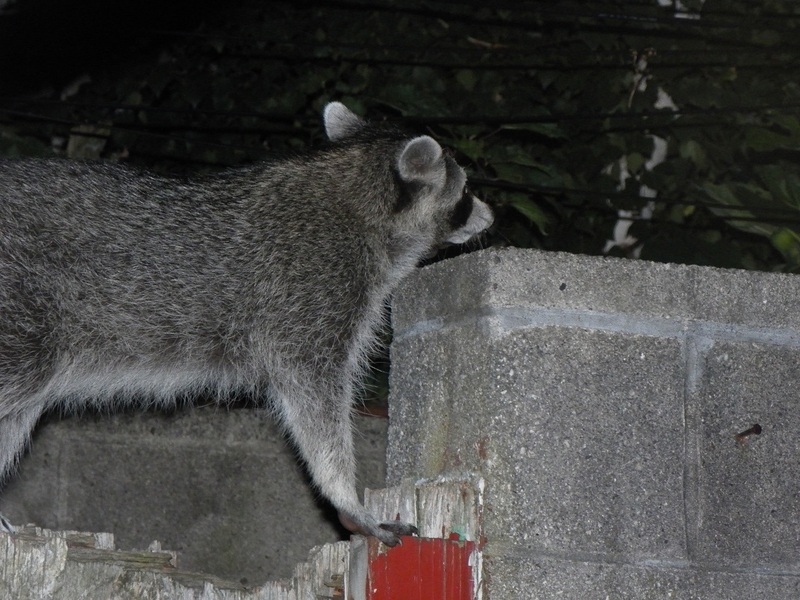 After a few weeks, and no more signs that the raccoon was making nightly visits, we let our guard down. Three later, the raccoon had his meal. Five summers is a decent lifespan for goldfish, but we’re still a bit saddened and somewhat incredulous. I’ve lived in or around Philly all my life. I’ve never seen evidence of raccoons. I’ll miss those little guys. I’ll miss the way they come to the edge of the sink whenever they heard the backdoor open. I’ll miss chipping away at the ice in the dead of winter. And yes, I’ll even miss the disturbing image of the eternally hungry Bertha with the occasional mouthful of the errant slug. YUCK!! …or was that Fish Two? 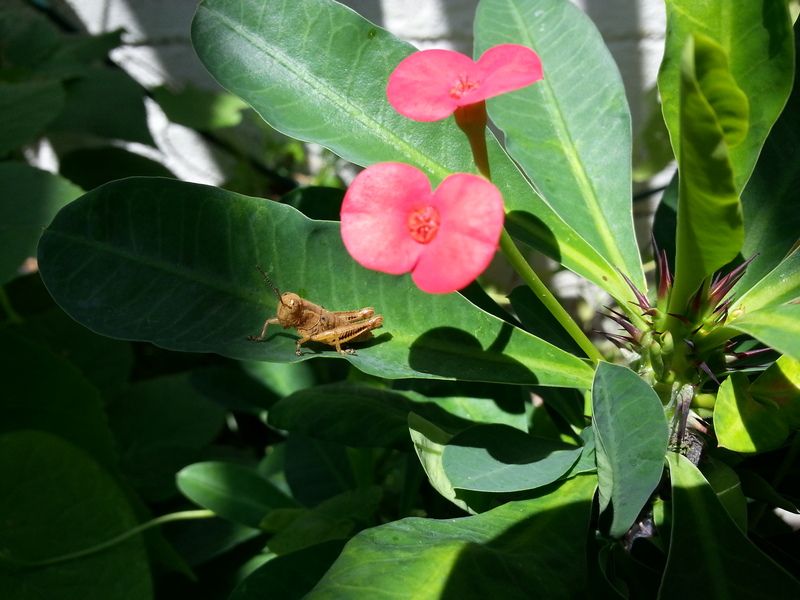 Yesterday I posted a pic on Tumblr of a grasshopper that was chillin’ in the backyard. 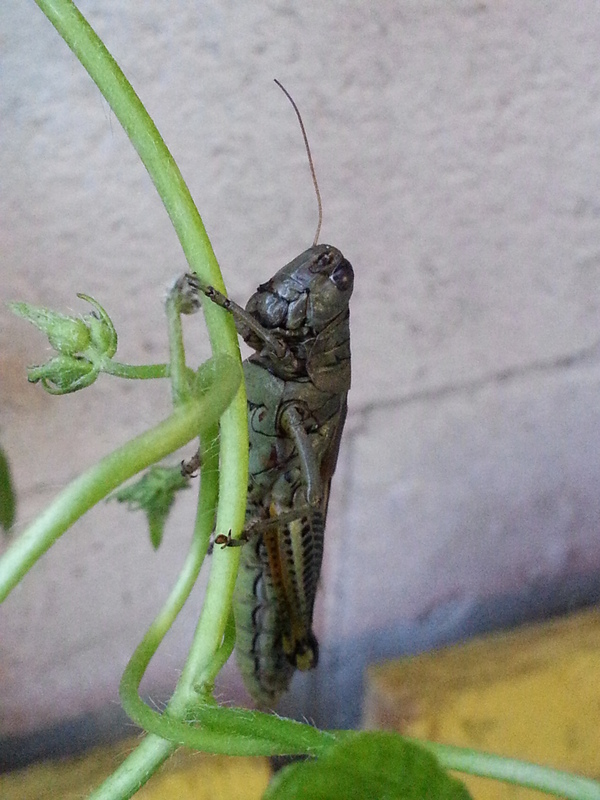 My other half suggested that Mr Hopper might be one of the many tiny hoppers that we saw last spring. The little guys were everywhere! — Apparently, they love basil. Here’s a pair of pics for comparison. Among the items buried in the back of the freezer was a thick tuna steak, which we bought about six months ago to make Orange Chipotle Seared Tuna. It’s a great recipe. I highly recommend it. Whenever I find good quality fish at a good price, I buy extra and freeze it. Of course, I do run the risk of forgetting those bargains as they make their way to the back of the freezer. So here I was with this slightly freezer burned piece of tuna that I really didn’t want to throw away. How could I save it? 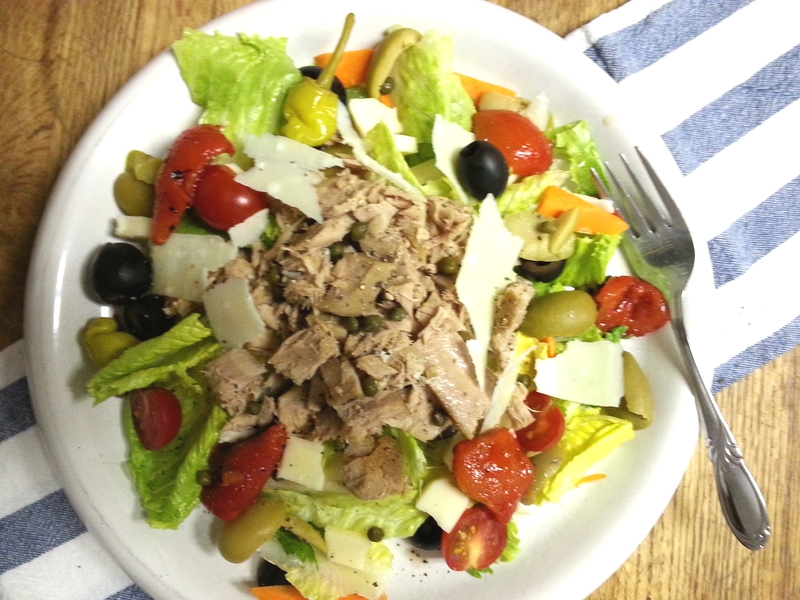 Searching the interwebs, I found several recipes for Olive Oil Poached Tuna. The tuna turned out great! The salad was delicious! Mary Ann comes to live with me. 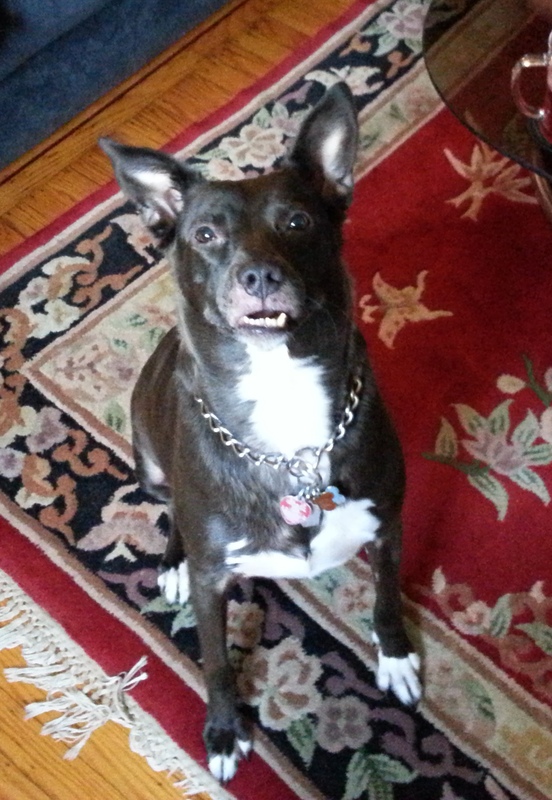 Here, she’s got her eyes locked on a treat I’m bribing her with. She’s got no interest in picture taking. …or so she’d have you believe. 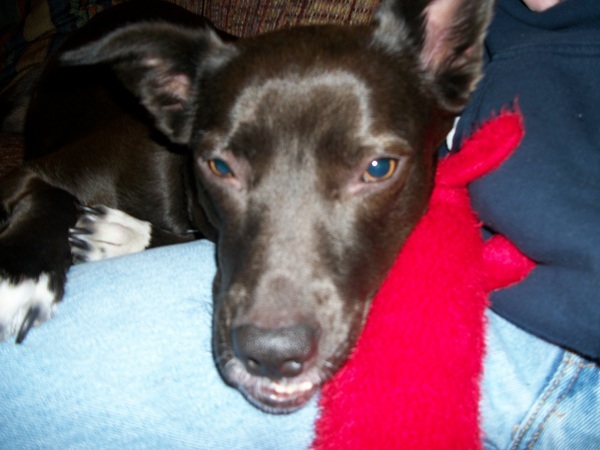 She might “pretend” not to like having her picture taken. that she secretly knows just how cute she really is. 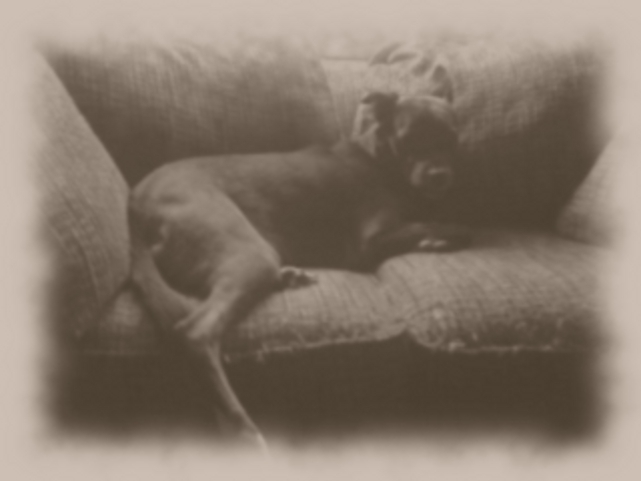 she might have been a pin-up model.